The stock market has not been kind to U.S. public construction materials firms in 2018. 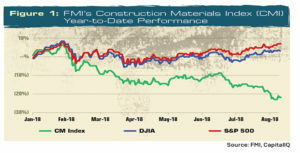 Since Jan. 1, FMI’s Construction Materials Index (CMI) has fallen more than 21 percent. Nearly 70 percent of those companies’ stock prices are within 10 percent of their 52-week lows, clear evidence of declining optimism among the investor community. So, what’s happening with stock prices? We believe three primary factors are driving construction materials stock prices downward. 1. The lack of an infrastructure bill. Heavily advertised by the incoming Trump administration, this has not materialized. Following President Trump’s election, infrastructure-related stocks soared on the prospects of a robust federal infrastructure package. While optimism lingered for most of last year, it has become increasingly clear that legislation will not pass prior to the November 2018 mid-term elections. 2. Investors are growing increasingly concerned about a market peak. Year-to-date (and as of press time), the S&P 500 is up a modest 6.9 percent, a long way from the heady growth of 2017. While recent GDP reports have been strong, a National Association of Business Economists survey suggests only 2.7 percent GDP growth in 2019 and an increasing likelihood of a recession in 2020. The good news is that if a recession does develop, it is likely to be short-lived. FMI projects stable growth rates in the construction market over the next three years. In single-family residential markets, FMI projects 7 percent growth in 2018, 4 percent growth in 2019, and 5 percent growth in 2020. Low unemployment, wage improvements and tax law changes are all growing demand for housing, while higher interest rates and a dwindling supply of single-family homes in key market areas create some headwinds. In highway and street markets, FMI expects 3 percent growth in 2018, 3 percent growth in 2019 and 2 percent growth in 2020. 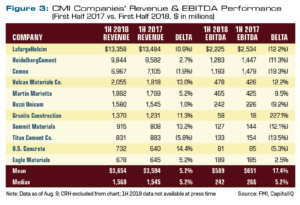 These acquisitions have taken a toll on the balance sheets of CMI firms. 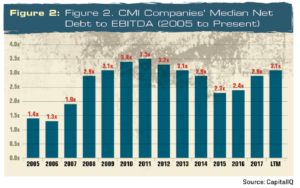 The median net debt/EBITDA (earnings before interest, tax, depreciation and amortization) among FMI’s U.S. CMI firms now exceeds 3.1x, their highest levels since 2013. While leverage ratios vary by company, debt has been trending upward in most cases. And despite low interest rates, growing debt loads present increasing risk, particularly in combination with the prospect of slower growth rates in 2019 and beyond. 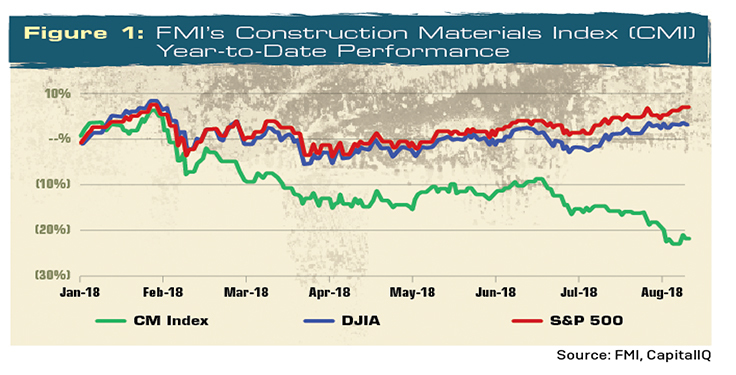 While stock prices have declined over the short-term, public U.S. construction materials producers have witnessed strong volume and revenue growth in 2018. 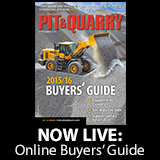 Vulcan Materials, Martin Marietta, Granite Construction, Summit Materials, U.S. Concrete and Eagle Materials all reported gains in excess of 5 percent in year-over-year revenue, with all but Summit and U.S. Concrete reporting growth in EBITDA as well. Cement production also plays a key role in driving earnings within CMI companies. Since 2012, there has been little change in domestic cement production capacity. In fact, the number of plants in the U.S. has declined due to more stringent environmental requirements. As demand for cement improved, most U.S. plants are operating at or near production capacity. This led to both a surge in profitability for cement producers and an increase in imports. 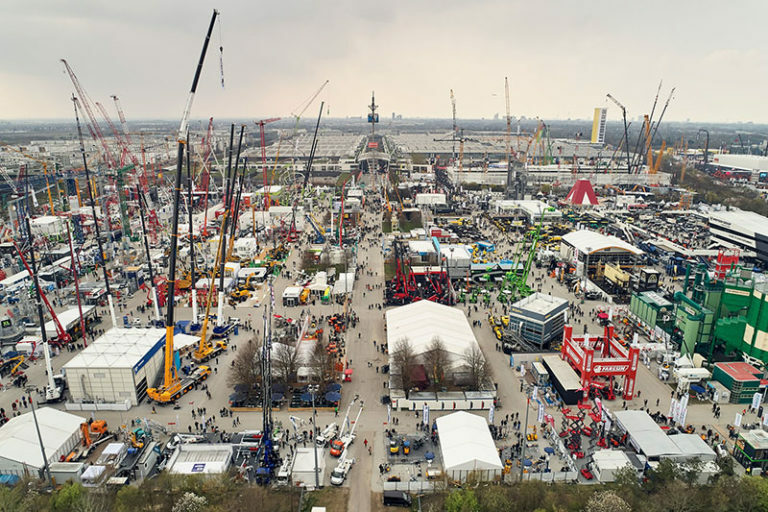 With improving financial performance and strong demand for construction materials, there remains a great deal of positive momentum in the sector and ample reasons for continued optimism. Infrastructure demand continues to grow, and states are increasingly finding ways to bridge the funding gap. Housing markets also remain strong, as inventories remain below their historical averages. Additionally, millennials, who are increasingly reaching a first-time home-buying age, are becoming active in the market. This continued optimism is driving a robust market for mergers and acquisitions, with active participation coming from nearly every strategic buyer in the marketplace. 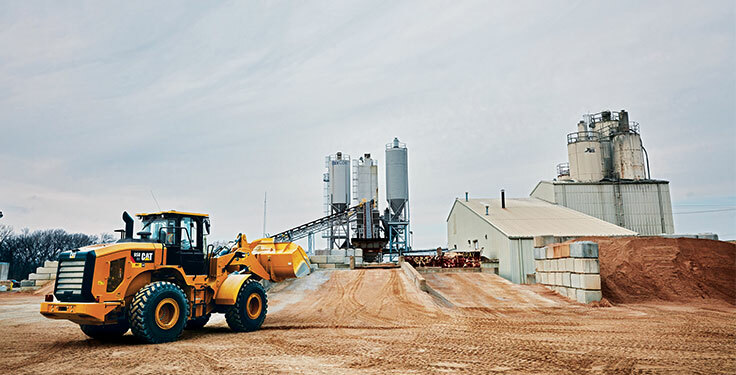 Even LafargeHolcim, which has remained relatively quiet since its merger in 2014, made two recent ready-mix acquisitions, one in Fort Worth, Texas, and another in Denver. The number of sellers has also increased in the past 12 to 18 months, consuming increased bandwidth within corporate development groups and allowing buyers to be more selective. And that takes us back to leverage. While the market remains active, strategic buyers are digesting large transactions and, more importantly, managing larger debt loads. This may change the behavior of buyers into 2019 and 2020, as large, platform deals may become less attractive and smaller bolt-on deals become more favorable. 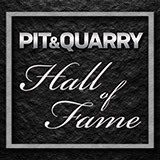 Summit Materials alluded to this trend in its second-quarter conference call, stating that the company had no larger platform deals that were imminent and that it struggled to find value in several cases. We anticipate this trend will continue in the coming months. Larger platform transactions may struggle to find the same attention they did earlier this year, as strategic buyers may see more value in bolt-on transactions in key markets. We also anticipate the strong market for cement in the U.S. will limit the degree to which buyers are willing to pay premiums for ready-mix businesses to protect share. In short, as strategic buyers become increasingly selective, the market may evolve from a seller’s market to a buyer’s market. The question is how quickly that transition takes place. George Reddin and Scott Duncan are managing directors with FMI Capital Advisors Inc., FMI Corp.’s investment banking subsidiary. They specialize in mergers and acquisitions and financial advisory services.